One of my new favorite bands, For King and Country, has recently taken these words and reworked them into a great song. “Let my life be the proof, the proof of your love,” repeats the chorus. (http://www.youtube.com/watch?v=FGuBoFjUZhE to listen) We can do all kinds of things in life and we can do them for all kinds of reasons. Some reasons are prideful, some are to avoid pain or to rechannel buried emotions, and some are self-serving in other ways. The truest actions, Paul tells us in 1 Corinthians 13, are rooted in love. Matt has a buddy from college who posted his blog the other day on his new website. He titled it “Love is Why.” His daughter Grace has a disease called Prader-Willi and in order to raise awareness and funding for research, JT has recorded a song that is downloadable on iTunes and at Amazon. (Visit www.gracieblueeyes.com to learn more) The reason behind his cause is his amazing love for his daughter. Love is why. 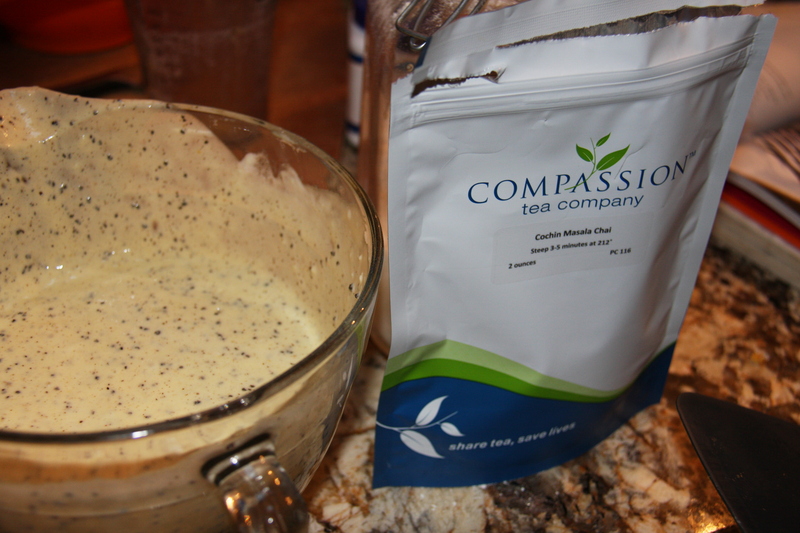 Love is why we at Compassion Tea are so passionate about selling tea. Yah, we really like tea and sure we get a kick out of sharing that passion and a really great cup of tea. But the sharing part alone would be a noisy gong or a clanging cymbal if it weren’t for the second part of our mantra… save lives. Through every membership we sell, every pouch of tea, every accessory or gift, we know that medicines and medical supplies are going to get shipped or carried over to Africa and lives are going to be touched in positive ways. It’s one of those ripple effect things. We sell tea. We donate 100% of after-tax profits to CompassioNow. CompassioNow collects these funds and other donations – monetary and medical. Those donations are then used to ship or are shipped to partner clinics in Africa. Here is an example of how those donations then touch people. Nellie Chitambo, a worker at Mission Medic Air in Zambia, recently wrote the following report: “The airplane is under maintenance so this trip was made using our land vehicle. It started as a normal trip when we left Ndola… Thursday morning. Unfortunately, the vehicle broke down partway to our destination. We had to rebuild the diesel pump and filter which delayed our arrival at the mission hospital significantly. We finally arrived in the early morning hours on Friday…. After resting, the medical team was allocated rooms to operate from and the team got their bags to the rooms to begin their work. There were so many patients that the Optician missed lunch in order to clear the long line of patients. 415 people served during a two day clinic in the bush! CompassioNow has in the past provided funding for that airplane which has carried more than one person to hospital in the larger cities to get treatment he or she couldn’t possibly receive in the bush. Back in November, CompassioNow team members carried over suitcases full of eyeglasses and shots of Novocaine which would have been used by the optician and the dentist during this clinic. We could stop here and pat ourselves on the back. Hey, great job, Compassion Tea/CompassioNow! But that would be all wrong. It feels great to know that what we are doing has dramatic impact on our neighbors in Africa, don’t get me wrong. But we love because God first loved us. And that love aches for those who haven’t been served, it rejoices for those who have, and it hopes for a future wherein we can love on even more people. Love is why. It’s summer and it has been hot. Tempers have been running quick and red. Energy has been flagging. Yet, the rigors of summer… the camps, the play dates, the swimming and tennis and horseback riding… must go on. One day at a time, we march through summer, prey to the heat, at the whim of the schedule and our own diminished interests. The garden needs tending, the chicks must be checked multiple times a day, towels need washing, and what the heck, let’s camp out in the backyard tonight. Pop the tent. Batter speckled with tea… interesting! And we’re only 1 ½ weeks into it. Bearing all this in mind, I couldn’t face making a “normal” dinner tonight. 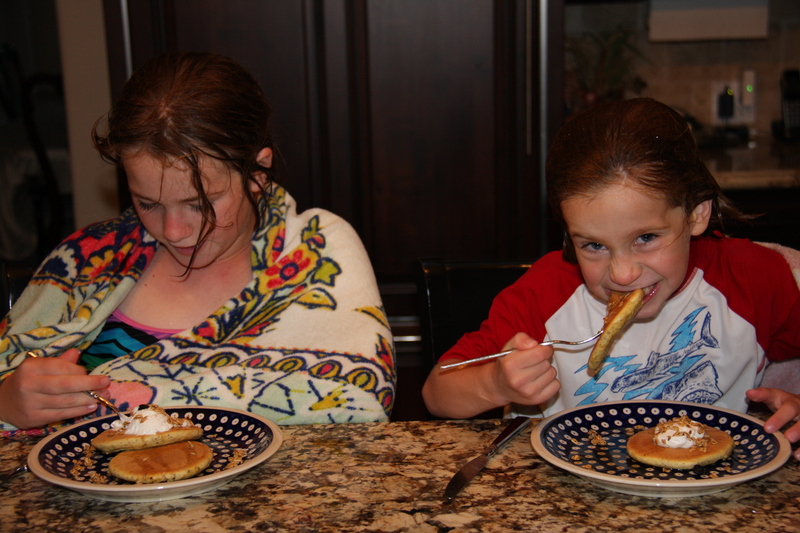 Often, when at my wits’ end, I opt for “breakfast for dinner”… a delightful break from the usual rigors of cooking, a quick way to get food on the table, and a sure way to get the kids to eat their dinner. Tonight, just to change things up, I decided to spice it up, too! The results have been nothing short of miraculous. As I type, Clara is reading and singing to Joseph; they are snuggled up on Joseph’s bed together completely forgetting the continual fighting of the other 12 hours of the day. 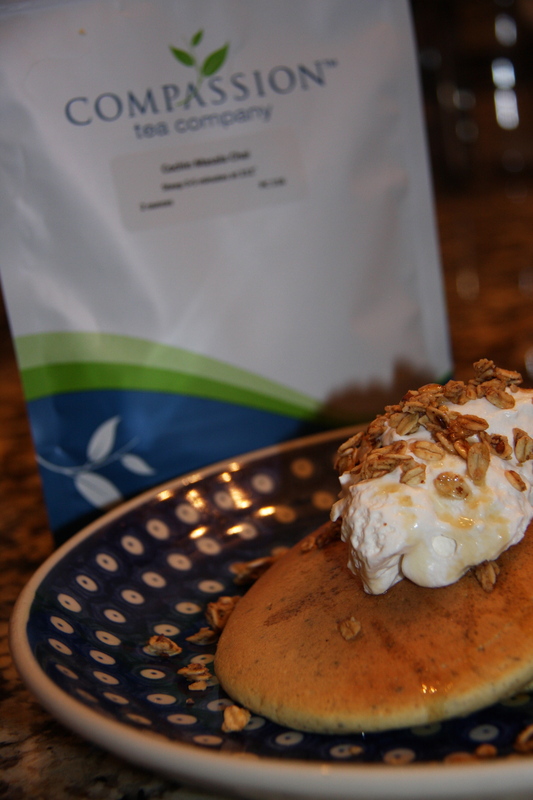 I am chalking it up to chai tea pancakes and I’m loving it! 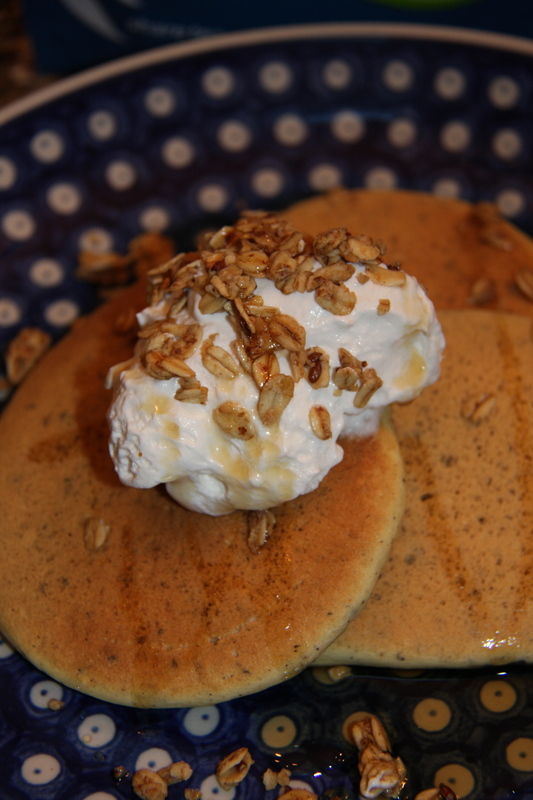 Pancakes topped with whipped cream, maple syrup, and granola… looking good! Whisk together the flour, 2 tbsp. sugar, baking powder, and salt in a large bowl. Add the milk, egg yolks, vanilla, and almond (if you use it) and whisk until smooth and thick. Beat the egg whites until soft peaks form. Add the remaining 1 tbsp. sugar to the egg whites and beat until stiff. Fold into the batter and fold in the ground tea. Cook on a griddle until golden brown in each side. Serve with maple syrup, yogurt or whipped cream, and granola. Makes about 1 dozen pancakes. Ready for consumption. Yummy happiness awaits! These pancakes are thick and fluffy, moist and spicy, sweet and pleasantly unusual. They would make a great brunch dish if entertaining. Add some fresh fruit and candied almonds, a cup of chai tea softened with milk and honey, and viola! Delicious! Fresh from the pool, the kiddos dig in. Joseph cleaned his plate in record time. 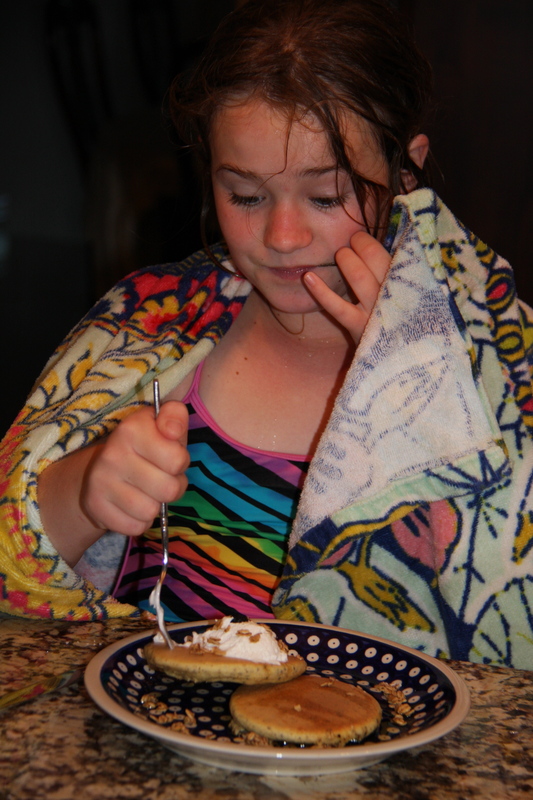 Clara’s eyebrows go up in surprised delight as she tries her pancakes. Now that was a great question! There is an overriding sense in Western culture that God is dead. Burning bushes, seas opening up for people to cross over, staffs turning into snakes and back again, flaming altars quenched by rains that appear out of nowhere after a lengthy drought… those are the stories of a time so long ago it almost feels irrelevant. It certainly feels antiquated and archaic. God just doesn’t appear to His people anymore, let alone send people into the world to prophesy. When these two young men showed up at my door, I was beginning an eye-opening process whereby God was opening my eyes to the ways in which He does work in the world minute-by-minute, second-by-second, behind the scenes, covertly arranging and mystifying the person willing to look. At the beginning of this process, God had introduced me to a woman, a very good friend, who dreamed dreams, saw God in places I would never have thought to look, and who boldly and uncompromisingly preached God’s Gospel. Did I believe at that point that God sends prophets into the world even today? Yes. It was fun to see the faces of those two men when I jumped into my own experience with a prophet of today. Yep. There wasn’t much else they could say or do except invite me to join them at church someday. Willing to look for God in my world, I am now seeing Him everywhere! One of my favorite places to look is in creation. When the white moon hangs over the brilliantly green ridgeline in the abundantly blue sky, my heart soars in praise of His creativity and goodness. But God is unlimited and even when we try to limit Him because of our own smallness, He shows up in big ways. If you are willing to look. For example, this blog has been writing itself in my head for the past week. On Friday, Joni Eareckson Tada emailed this as her daily devotional. It’s time for the NBA basketball finals. When Ken and I went to a playoff game in the Los Angeles Staples Center, we sat in the cheap seats-up so high in the stadium we had a difficult time seeing the basketball players on the court. They looked so small. But then I glanced at the towering jumbo screen above the court. What a difference! We could see every player up close. Even facial expressions! The screen magnified what was already there. The magnification didn’t actually make the players bigger, they just seemed bigger to our eyes. Every aspect of each player could be enjoyed. Here’s my point: When we “magnify” the Lord, we make the God who looks small in the world’s eyes seem…huge! No, we could never change anything about Him. He’s the same “size” He has always been. We can’t make Him any more grand or great or powerful than He already is. We just “enlarge” Him before the world’s eyes so they can see Him up close. As Christians, our lives are a little like that jumbo screen. Through our actions and attitudes, we enable others to see God better. When we let the Lord showcase His grace and power in our lives, when we display His peace and patience and joy in our daily attitudes and circumstances, then we truly are magnifying Him. God knew what was on my heart; He probably put it there! Here’s a wink and a nod that I’m on the right track. Because we put limitations on God, have reduced Him to archaic and antiquated, we also don’t look for Him. But believe me, He is still showing up! The Compassion Tea team believes that God is our CEO. That is one of the founding principles of our company. We invite Him to join every activity we have whether it be our weekly meeting or while we are preparing for a large event. We believe He comes and directs our paths. This week, He has led us down some amazing roads and reminded us of people He has put in our paths before who might be resources of information and aid to us. We only see a few puzzle pieces at the moment, but knowing that God sees the whole completed puzzle before us is enormously calming. He will reveal each piece as it becomes relevant to our road, to our puzzle. And we are so excited by the possibilities for outreach and compassion. Let me relay one way God showed up for us recently. The first weekend in June was the big World Tea Expo in Las Vegas. If you follow us on Facebook, you know that some of our team attended. Ed and Wendy Bjurstrom had recently been to London for business. While there, they had the opportunity to purchase a special tea produced by the East India Company and picked from a bush HRH Prince Philip planted in 1954 in Sri Lanka. Only 500 caddies of this tea were produced and numbered. Ed and Wendy presented this gift to Anne and Lee Kennedy, Compassion Tea’s dynamic president and spouse who have done so much for the company, while in Las Vegas at the Expo. The number of this particular caddy? 85. Because they are willing to look for God, Ed and Wendy asked if anyone could come up with a special significance to that number. Lee did. “We have 85 memberships as of today!” A wink and a nod from God. When Lee and Anne returned home, membership 86 came in! I think the world sometimes scoffs at Christians who look for God to show up and who see His influence. Happen stance, coincidence, fortune, magic, science, “miracle of modern medicine,” astrology are all ways the world today explains God showing up. Let’s call it what it is, people. God’s got a wink and a nod for you, too. Will you catch it? In their March 2012 newsletter, Danny and Nancy Smelser, who serve as MD and RN at the clinic, retold the story of a 32 year old man who had been hit by a motorcycle last December. Because he was unable to pay for the leg surgery he badly needed, he had been discharged from the government hospital. Desperate, in severe pain, and badly infected, the man arrived at Tanzania Christian Clinic. They removed the dirty cast and bandages and assessed the situation. Steady rounds of antibiotics and continuing dressing changes have eradicated the infection and through the help of the TCC and its supporters, the man is awaiting surgery scheduled at a teaching hospital 2 hours away. Treating the medical needs of patients who come to the clinic is only part of the picture. TCC also believes in empowering local peoples with knowledge of how to treat and prevent disease, infection, and wounds. Mobile medical clinics go around to areas surrounding the clinic with the intent of teaching. This, too, is an important element of CompassioNow’s mission and vision for helping. CompassioNow’s board and founders believe that part of the transformation of the African continent will come about through the “development of self-sufficient communities.” In a place where the patient-to-doctor ratio is a staggering 60,000 to 1, the odds are that a person isn’t going to see a doctor in his/her lifetime. But maybe a neighbor has and maybe that neighbor knows what to do for a skin infection or maybe that neighbor teaches how to wrap a wound to prevent infection. In a place where $1.50 can save a life, a little bit of knowledge can save many lives.